Stir your peanut butter well to mix up the oils then add the maple syrup and salt, mix well. Next add the coconut flour, 2-3 tablespoons depending on how runny the peanut butter is. You want the mixture to become a firm, doughy consistency. If you add too much coconut flour or your peanut butter is very dry, add more maple syrup. Allow the mixture to sit as the flour will soak up more moisture over time. 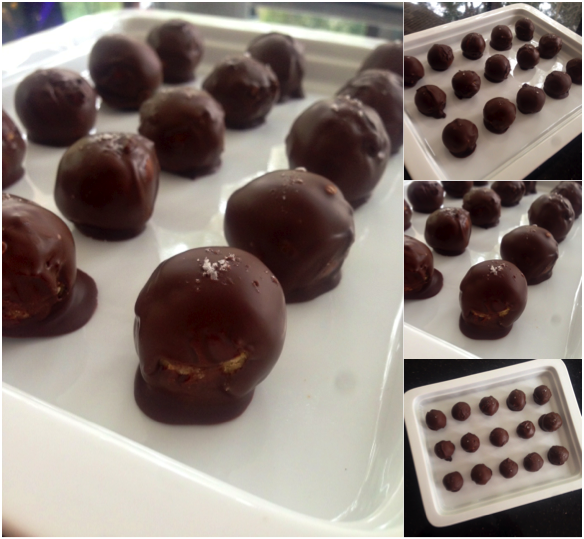 Roll the mixture into balls and place on a tray. 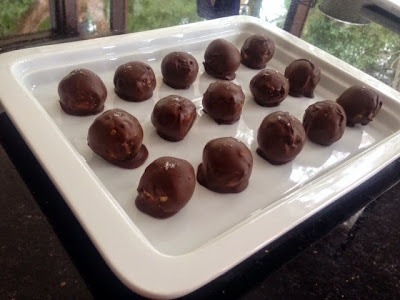 Melt the chocolate and dip the peanut balls in to coat. I sprinkled a pinch of salt on top to finish. Place them on a tray in the fridge until set. And thennn.... Eat them! So fast and easy... and they make the PERFECT movie night treat! YUM! 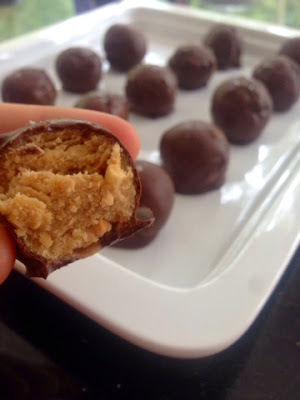 I try and avoid peanut butter nowadays, so thinking about doing this with almond or another nut butter, because it looks too good not to try! Great idea! I'm sure that would work... and still be delicious!